Purchasing a vehicle is one of the most important financial decisions that you will make. Due to the cost of purchasing a vehicle, people generally have to obtain financing. Banks and private lenders offer new and used car loans to help individuals with purchasing a vehicle. If you are considering taking out a loan in order to purchase an automobile, there are some things you can do to simplify the process. Some of these things may require a bit of time and research, but they can save you a great deal of money. Prior to even looking for a vehicle, you need to check your credit score. There are three major companies that lenders generally use: Experian, TransUnion, and Equifax. Each company will allow you to obtain a free report once each per year. Look over the report and make certain that all of the information is correct. If not, you will need to contact the companies directly to have the situation resolved. 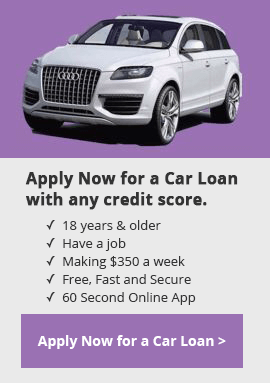 Although we accept applicants with bad credit it is still important that you confirm everything in your credit report is as accurate prior to applying for a car loan. This will improve your chances of getting the best interest rate with the lowest down payment. Get started now to obtain my my Free Credit Score. When you are looking for a car to purchase, you want to be certain that you select one that is in good condition. Give it a thorough test drive and have it checked out by a mechanic prior to buying it. This will help you ensure that the car will last the duration of your car loan with the least amount of issues. The type of vehicle you choose may also effect your interest rate. For example, new cars tend to have better interest rates than used cars. You also need to keep in mind that many lenders will not finance a vehicle if it is more than seven years old. Finally, prior to signing any loan papers, make sure that you read everything carefully. Sometimes there are hidden fees included for items that are not necessary.